Some of the earliest and best “country blues” records were from Texas, where the local blues style featured expressive vocals and simple, relaxed guitar accompaniment with jazz-like improvisations. 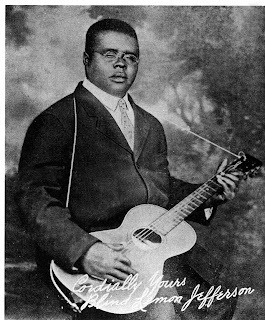 “Blind” Lemon Jefferson was the first artist to record in this style (in 1926), and his early records proved very influential on future Texas bluesmen. 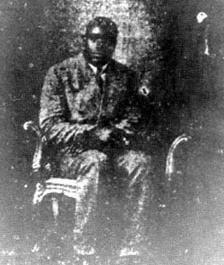 Jefferson recorded “Black Snake Moan” twice: the first was originally titled “That Black Snake Moan ” and was released as a B-side in early 1927 on the Paramount label (catalog number 12407); the second was released later that year on Okeh backed with Jefferson’s first recording of “Match Box Blues .” A Paramount version of “Match Box Blues” was then recorded and released as an A-side later in 1927. At the time, Paramount was a discount record label that catered to the “race” market, and was infamous for its low-fidelity recording techniques and records made of inferior-grade shellac that scratched easily. As a result, the Okeh versions of these songs have fared much better over time, while even the best copies of the Paramount versions are marred by a lot of hissing surface noise. The actual performances on these records are all strong, but the A-sides are considered definitive: “Black Snake Moan” on Okeh, “Match Box Blues” on Paramount. By contrast, the guitar is constantly in the foreground of the Paramount version of “Match Box Blues ,” and seems almost to be competing for attention with the vocals, improvising wildly at times, while still managing to keep rhythm. In the end, it somehow works and makes for a very powerful and memorable record. Alger “Texas” Alexander did not play an instrument, relying on others to accompany him. But his wonderfully expressive voice was one of the best in the Texas blues scene, making excellent use of vibrato. “Long Lonesome Day Blues” suffers from poor recording quality, but the vocals are still impressive and convey an astonishing depth of emotion. The excellent guitar work here is provided by Lonnie Johnson, who would soon establish himself as a guitar legend with a number of boundary-breaking blues and jazz recordings. As with Blind Lemon Jefferson, both Alexander and Johnson take liberties with the rhythm and melody, creating a free-form improvisation that hints at jazz.